Although it’d be nice to be able to just go off and get a massage on a regular basis, it just doesn’t usually seem to work out. Be it due to a busy schedule or just not enough cash flow to be able to afford it. Which is why at home massagers can be found in just about any possible form you could think up. Some are extravagant and nowhere near affordable, others are smaller and won’t break the bank. Thankfully this eye massager is one of the cheaper ones out there. After staring at a computer screen all day or even flipping through a text book for hours on end, your eyes just get a little on the sore side. 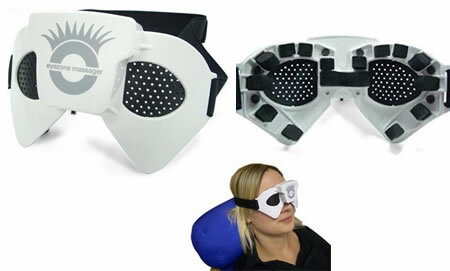 Instead of just ignoring it and pushing through, you could take a quick break and pull out this Eyezone Eye Massager. It straps to your head and uses vibrating foam pads. It claims to relieve not only sore eyes, but migraines, sinus problems and helps prevent age related loss of sight. You can purchase this for £14.95 or about $25 from Gizoo. As i spend up to 15 hours per day in front of my computer I can relate. Some days I wear sunglasses as I cannot cope with the strain on my eyes. This is an absolute boom for tired eyes.